Preview Date & Times: For more details or a private showing, contact Greg Witt, REALTOR with Edina Realty, 320.234.0929 or GregWitt@EdinaRealty.com. IMPORTANT INFORMATION, PLEASE READ. DO NOT BID ON THIS LOT. **Here are a few pointers to help your Proxibid experience work better for you. ** The software works and looks best if you use Google Chrome or Firefox as your browser. Do not bid from a smart phone, iPad or tablet. Those items don't update as quickly as a desk top or laptop computer and it may appear you have the high bid when you actually may not. This is especially important while the auction is closing. The software has extended bidding. If someone bids on an item in the last seconds the closing time on that item will extend for 2 minutes. That will continue on that item until there is no activity for 2 minutes. If you are a new user or if you have a slower or unreliable internet connection, we recommend using the maximum bid feature. If you leave your maximum bid, the software will advance you as other people bid. If the bidding stops at an amount less than your maximum bid, then that is all you pay. Unlike other auction companies, we do not have access to your maximum bid, nor does anyone else. Thank you! 136.42 Acres Carver County, MN farm land with approx. 132 USDA tillable acres. One large field with access on CR 33 & Rice Ave.
S 1/2 of NW 1/4, & South 70 Acres of S 1/2 of NE 1/4, all in Section 6, Township 114, Range 25, except the building & home site. See survey. And a parcel in the SW 1/4 of Section 6, Township 114, Range 25 described as follows: Commencing at the center point of Section 6, thence running South 7 rods to a point, thence running West 17 rods to a point, thence running North 4 rods to a point, then West 121 rods to the West line of said Section 6, thence North 3 rods to a point, thence East 138 rods to place of beginning, containing 3.12 acres more or less. Down Payment: $20,000 non-refundable earnest money down on purchase agreement shall be paid within 24 hours from the close of bidding (Wed., March 6, 2019). Closing: Closing on this property shall take place on or before Tue., April 16, 2019. Buyers wishing to close earlier will be accommodated. Seller & Auctioneers Disclaimer: All announcements & updates made by the auctioneer on the website, shall take precedence over any previously written material or oral statements made. Conduct of the auction, increments of the bidding & decisions as to the high bidder will be at the direction & sole discretion of the auctioneer. The information contained in the brochure is subject to the inspection & verification by all parties relying on it; no guarantee, expressed or implied, is given of the information contained in the brochure. No liability for its accuracy, error or omissions is assumed by the owners or the agents. Property sells in as-is condition. Buyer will sign an as-is addendum. Terms: $20,000 non-refundable earnest money down on purchase agreement shall be paid within 24 hours from the close of bidding (Wed., March 6, 2019). Cash, personal & company checks or certified funds will be accepted. Balance in full due on or before Tue., April 16, 2019, the date of closing & possession. Buyers wishing to close earlier will be accommodated. Buyers to have financing arrangements made prior to bidding on the auction with no contingencies of any kind accepted in the purchase agreement. A 6% buyers premium applies to this property & shall be made part of the purchase price. Property sells be the acre times the bid. 136.42 acres plus a 6% buyers premium. 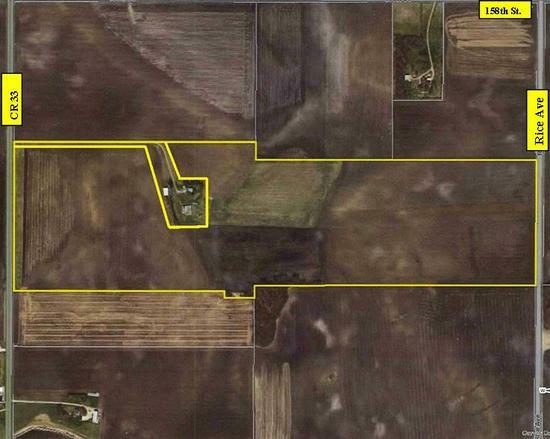 Example: 136.42 acres X $6,500 per acre + 6% buyers premium = $939,933.80 sale price. 1031 tax exchange language can be included in the purchase agreement at the buyers request, however, any 1031 tax exchange shall not alter the terms, conditions, or closing date of this transaction. Taxes: 2019 real estate taxes to be paid by the seller. Agency Disclosure: Fahey Sales Auctioneers & Appraisers & Edina Realty represent the seller in this real estate transaction. Dual agency may apply. Referral Fee (Broker Participation Accepted but not Required): A $1,500 referral fee will be paid to the buyers agent that registers their client with the auction company prior to the client registering & bidding at www.faheysales.com. Broker registration form & instruction can be found there.